It will be an emotional scene as more than 36 thousand runners attempt to complete Monday's Boston Marathon. 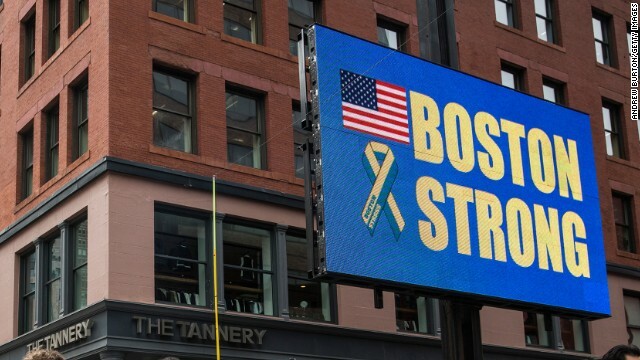 Last year, two homemade pressure cooker bombs placed next to the marathon’s finish line on Boylston Street killed eight people, tore away limbs, and troubled many Americans' hearts as it became apparent that terrorism had again visited the United States. Iraq’s Ambassador to the United States, Lukman Faily, is from a country splintered almost daily by sectarian terrorism. Car bombs, kidnappings, and horrific acts of violence continue to plague an Iraq trying to recover and rebuild after more than a decade of armed upheaval. Faily was serving as his country’s ambassador in Tokyo last year when Martin Richard, Krystle Campbell, and Lingzi Lu were killed and hundreds were injured in the Boston Marathon bombings. The pictures of desperate faces and devastation were familiar to him. When Faily was told last summer he would be posted to Washington, he told himself he would run in the 2014 Boston Marathon. “This is a way for me to say ‘thank you’ to our American friends,” says Faily. A self-described “techie,” Ambassador Faily is not your typical iron man. He ran two marathons in Japan to benefit tsunami victims, but is not normally a workout fiend. Now, with the intensity of work here in Washington and preparation for upcoming parliamentary elections at the end of this month, Faily’s been relegated mostly to jumping on the treadmill to get in marathon shape. “The running is personally very satisfying, but there’s a bigger issue – it’s an issue of closure,” says Faily. After years of men and women of the US military fighting in his country, dying for his country, it is a small token of appreciation he says for him to run and fundraise on behalf of the One Fund as a way for Iraq to give back to American victims of terror and also for the another charity, Education for Peace in Iraq (EPIC). Faily notes that just as the accused perpetrators of the Boston bombings, Tamerlan and Dzhokhar Tsarnaev, were Chechens, Iraq is seeing an influx of foreign fighters migrating, some from Chechnya, into his country. Terrorism is a global issue, he says, with a narrative transcending ethnicity or religion. “The Oklahoma City bomb was placed by Caucasian Americans and there are other examples, violence and terrorism is not peculiar to Iraq – look at also Syria which is directly impacting many nations in the region including my own,” says Faily. Ambassador Lukman Faily hopes his participation in the 118th running of the Boston Marathon will show how one Iraqi originally from Baghdad is trying to travel the long distance from war to peace on the hilly streets of Beantown while thousands cheer from the sidelines.